So BETT is over and done with now. It was a pretty tough week for me. I was starting to come down with the flu and it actually meant I missed one of the days. Thank you to Greg Hughes who covered my presentations on the second day. To give you an idea of how bad it was, I had completely lost my voice and now, more than a week later, my voice is still struggling. Across the week I did a number of presentations on the Apple Solutions Expert Village alongside Catherine Mangan, Abdul Chohan and the aforementioned Greg Hughes. Apple Distinguished Educators I have known for a long time and have huge respect for. Thank you to them for their friendship and support across the BETT event. As I try to with many of my public speaking events, I am sharing my various presentations free of charge. Yes, I do run a business and I do charge companies and schools when I work with them as this is my main source of income now. I do massively believe in paying it forward however. I do not do what I do to make money, simply to make ends meet. I still want to make a difference in education and not so that I make a significant profit. With that in mind, here is the first of my four presentations from #BETT2017 where I examined the different ways in which iPad can be used to help get the use of technology right within the classroom. Unfortunately, none of the presentations were recorded so you only have the slides to go on, however if you have any questions about any of the slides, please do drop me a line in the comments. 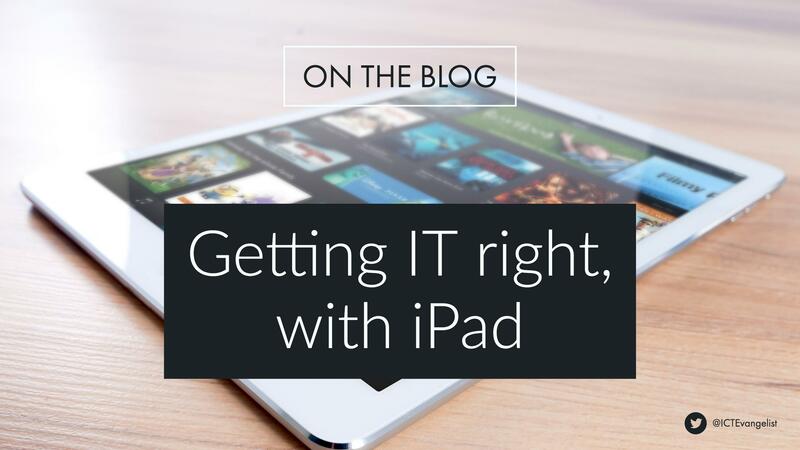 Here is my presentation, “Getting IT right, with iPad”.